Please use this thread for any news or discussion about any urban developments or projects proposed or going up in Buckhead. Please note that this is a discussion thread for urban developments and projects of all sorts, not just skyscrapers. Information about skyscrapers is by all means welcome because they are a part of an urban environment, but they are not the only part of an urban enviroment. Here's a pic of the almost completed Terminus 100. 10 Terminus Place is a 142-unit condo building that is under construction above the parking structure and Terminus 200, a 25-story office building will break ground in May. Gee, I was just reading that article on the front page of the Atlanta Business Chronicle. There's sure a lot of new office space coming online at once -- between the two Terminus buildings, 3344 Peachtree, 3630 Peachtree and the additional Alliance Center tower that's 2.6 million sf. That's like putting up four 1180 Peachtree buildings at once. And that's in addition to another 1.3 million sf in Midtown. I guess they are proceeding on the build-it-and-they-will-come theory, but I wonder where all the tenants will come from. So are all/most of these spec office projects? krazeeboi, yes, I think the projects in both Buckhead and Midtown are spec. Perhaps there are negotiations for big tenants which haven't been made public yet. Well they're spec proposals but its unlikely that they'll break ground without a committment from tenants they're already negotiating with. I hadn't seen renderings for the two new Terminus towers, so I'll post these. Sorry if they've been posted before. I like seeing that both buildings are including ground level retail. While I like all the buildings individually, they fit together almost too perfectly, making the complex look a bit monotnous. None the less, its better to have good design monotony, rather that a bunch of precast concrete boxes. Martinman, I'm sure you're right although sometimes I wonder. 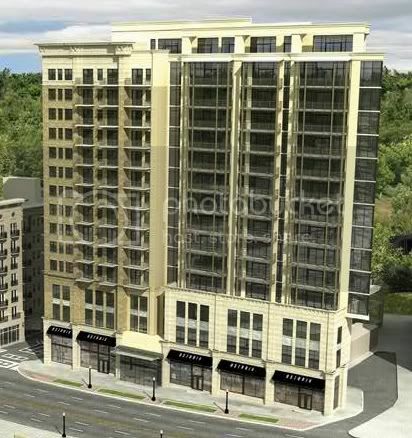 What happened with that Peachtree Pointe building in Midtown, for instance? That place looks vacant to me. And I think the developer of Two Alliance Center was quoted as saying they were going ahead even without any tenants. What I know about commercial real estate wouldn't fill a thimble, however. I guess that's why those guys are billionaires and I'm still a wage slave. Yeah I meant that that will be the case for most of them but even the case of Two Alliance, that pronouncement might just be a bit of posturing to draw attention to the development. Come to think of it, almost all of those referenced in the ABC article have said basically the same thing at one time or another. I do know that the office space planned for Midtown is being timed to coincide with the final years of some large leases. The Peachtree Pointe building was 100% spec developed by favorite forum whipping boy Dewberry. It was considered unwise at the time, despite a strong Midtown market and is still empty as far as I know. I think this is the exception and not the rule. I believe that most developers are trying to get ahead of demand a bit. Future growth trends indicate another 2 million people will live in the Atlanta metro within the next 20 years. We just picked up another million residents in the last six years and people will not move to Atlanta if there aren't jobs. Without the jobs there isn't demand for office space. Basically, the push in the spec office market is a bet that the metro will continue to build new business, attract corporate relocations and expand existing businesses. As long as developers are willing to wait for a sizable nibble from a tenant before building, the market should stay relatively stable. How tall is it going to be, and what is the address for it? It'll top out at 42 stories and 580 feet and is on Peachtree near Lenox Mall. The facade looks like it might be stone and brick....if so, this is a winner. It has great street presence. The left side of the building does look a lot nicer then the right. The left side has a more historic look while the right has the more modern look. It doesn't make sense on why they would make the building half and half though. Might be to cater to more potential buyers. Some might prefer the floor-to-ceiling glass on the left side, others might prefer the more historic style. And here's a view, from left to right, of cranes for Parc @ Buckhead, The Mansion, and 3344 with Terminus on the right. Very nicely done! Look at all the cranes! Looks like Vinings. My guess would be Overlook. ^Yep, right at the edge of the lot where this development is starting to go up. Atlanta-based Noble Investment Group, which also is converting the Midtown Sheraton into a W, is redeveloping the Crowne Plaza in Buckhead for about $100 million. Thom Filicia, who has earned international fame as a member of Bravo's "Fab Five" on "Queer Eye for the Straight Guy," will direct the interior design. Ok i'm confuse, what is the total number of stories the mansion is ending up with, i've heard 42,48,52 and now 58, those anyone have any info on the exact number.